Sciatica and lower back pain affect millions of individuals per year. Even though for most people it only lasts between 4 – 8 weeks, up to 80% of people have recurring pain within a year with 48% having moderate to severe pain. Symptoms of sciatica include lower back pain, pain in the buttocks or leg when sitting, hip pain, burning sensations down the spine or leg, weakness or numbness in the feet or legs, constant pain in one side of the buttocks, and difficulty standing up. It usually affects one side of the body. Judith Hanson Lasater is a physical therapist and yoga instructor and describes sciatica as a condition when the shock absorbing disk between two vertebrae bulges out creating compression on a nerve root that radiates down the leg. For some people, the pain is limited to either the spine or the leg while some people experience both. Causes of sciatica generally include being overweight, pregnancy, inactivity, a poor mattress, wearing high heels, Spondylolisthesis, degenerative disk disease, Lumbar spinal stenosis, and muscles spasms. Yoga helps with sciatica not only from the obvious stretching and strengthening of the muscles and spine but also the effect it has on the sympathetic nervous system. When experiencing stress, the sympathetic nervous system is activated igniting the fight or flight response which tightens muscles throughout the body. Yoga also helps correct posture which can aid in the reduction of lower back issues. Additionally, when practicing the 8 limbs of yoga specifically pranayama and meditation, students can learn how to manage their pain. It is important before starting any exercise practice to talk about your plan with a medical professional. Additionally, there is no one size fits all approach to yoga, seeking a qualified yoga instructor, preferably a yoga therapist will help customize a plan for your needs. The poses below are generally safe postures but precaution should always be taken when practicing. If something feels painful, it is best to try to find a modification or skip the pose completely. Alignment is also crucial, so either practicing with an experienced teacher, doing private yoga sessions, or practicing at home slowly with self-study can be more beneficial than attending a general yoga class. Cat/Cow is the combination of two postures. In the book Yoga as Medicine, Lasater recommends 2 variations of cat/cow, both of which create mobility in the spine. Traditional Cat/Cow: Complete the traditional cat/cow for between ten to twenty breaths. Start on all fours, a blanket can be placed underneath the knees for additional support, on the inhale release the belly and take the gaze forward. On the exhale, gently arch the spine and take the chin towards the chest. Movements should be slow and follow the breath. Modification of Cat/Cow: Start in traditional tabletop posture just like regular cat cow. On the exhale, take the gaze towards the right foot. As you gaze back, the right shoulder and right hip will naturally get closer together, notice the stretch in the left side bottom. Inhale and come back to center and then repeat on the left-hand side. Yoga Journal recommends monkey for sciatica. While full monkey may not be accessible for practitioners, half monkey is a more accessible version. Before starting, have two blocks available. From a kneeling posture, extend the right leg forward and straighten the leg. Keep the hips above the left knee. Fold forward at the waist and let the blocks frame the right leg near the shin or the knee. Hold for several breaths and then repeat on the opposite side. Matthew Solan recommends triangle for sciatica using a wall for support. For assistance with this posture, having blocks or a chair is helpful To start, stand about 2 – 3 feet away from the wall with the right side of the body parallel to the wall. Stretch the arms into a T position. Widen the feet so the outside of the right foot touches the baseboard and the left foot is almost the width of the arm span. Rotate the left toes towards center of the room. Hinge at the waist and let the left hand come towards the chair or blocks behind the left leg and rotate the right palm forward. Stay long through the obliques and the rib cage. Take long deep breaths and hold for 10 – 15 breaths and switch sides. To start revolved triangle, come into Warrior I. It may be useful to have a block or chair on the outside of the front leg. Lift the opposite arm from the standing leg up towards the sky then rotate from the lower spine and place the hand on the chair, block or floor as both legs straighten. Hanson Lasater notes that by using support for the lower arm it maximizes the therapeutic application of the posture by creating more stability which creates freedom in the lower spine. For pyramid, it is helpful to have blocks or a chair for support. Start in mountain pose and step the right foot forward. While lengths can vary, start with a shorter length between 1.5 to 2 feet. Ensure both feet are facing forward. The blocks can either frame the right foot or place the chair in front of the foot. Reach the arms up towards the sky and begin to hinge forward at the waist and keep the legs straight. Release the hands down towards the blocks or the chair. To help strengthen, the back Hanson Lasater recommends a cobra variation that strengthens the back. Lie down on the belly and keep the feet hip distance apart or a little wider. Let the arms come along the side of the body. On the inhale left the chest, shoulders, and forehead off of the mat and take the gaze slightly forward. Hold for several breaths before lowering down and repeat three times. To passively stretch the hip rotators, try modified cow face pose. Start by sitting on top of a blanket or yoga wedge to neutralize the pelvis and extend the right leg forward. Gently flex the left foot and cross the left thigh over the right. Lengthen through the spine and on the exhale fold forward at the waist. Hold for 4 to 6 breaths before repeating on the opposite side. 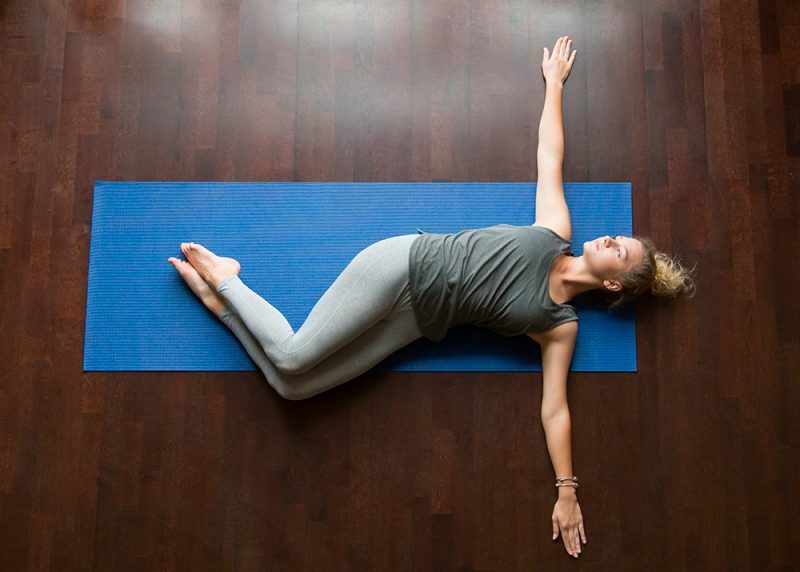 Also known as Wall Eye, performing pigeon at the wall can help get the body into proper alignment and hold the postures in a more comfortable way than traditional pigeon on the floor. To start, bring the legs up the wall and let the buttocks touch the wall as well. Some people may want to place and blanket underneath the lower back for support. Gently flex both feet and place the right ankle on top of the left thigh. Depending on the flexibility of the hips and lower back, some people may stay right here if they already feel the stretch. To go further, place the sole of the left foot on the wall, the left knee will naturally bend. Begin to lower the left foot down as the left knee gets closer to the face. Do not let the lower back rise. While lowering the foot, continue to rotate the outside of the left leg towards the wall. Hold the posture for 15 to 20 breaths before alternating sides. Start on the back and bring the knees towards the chest. Cross the right thigh over the left thigh. Release the arms out to the sides in a T with palms facing up. Release the knees to the left-hand side of the floor and take the gaze towards the right hand. If the legs cannot lower down towards the floor, blocks or a bolster can be placed underneath the legs for support. Hold for 10 to 20 breaths. On the inhale come, let the knees come back to center and then the legs. Uncross the legs and complete on the opposite side. Supported bridge will help stretch the spine while keeping the piriformis relaxed. For this position, you will need a block. Start on the back with the feet planted underneath the knees hip distance apart with the arms along the side body while the hands press into the mat. While keeping the gaze towards the sky, lift the hips up and place the block underneath the sacrum. Hold the posture for ten to twenty breaths before coming out of the posture. Sciatica is a common ailment that can cause discomfort or pain for many people. Yoga can assist by stretching the spine, hips, and legs as well as activating the parasympathetic nervous system.